What can be done to help my premature baby mature faster and avoid breathing problems? Premature birth poses many risks for a baby. When a baby is born prematurely, the lungs and other organ systems aren’t fully developed, which significantly increases the risk of infection, respiratory distress, and hypoxic-ischemic encephalopathy (HIE), among many other issues. These birth injuries can lead to permanent disabilities such as cerebral palsy, seizure disorders, and developmental delays. The best way to prevent problems associated with premature birth is to prevent the baby from being born preterm. Close monitoring of the mother during pregnancy will enable the physician to detect risk factors for premature birth. When medical professionals are aware of risk factors and provide appropriate care, outcomes for the mother and baby can be very positive. However, if clinicians behave negligently, the consequences can be serious. What Measures Can Be Taken to Help my Baby Avoid Breathing Problems? When a baby is less than 34 weeks’ gestation and the physician suspects preterm birth is imminent, corticosteroids (such as betamethasone) should be given to the mother to reduce the incidence and severity of respiratory distress syndrome (RDS), intraventricular hemorrhages (brain bleeds), sepsis, and periventricular leukomalacia (PVL) in the baby. When appropriately given to the mother, corticosteroids help the baby’s lungs and other tissues mature before the baby is delivered. If the baby isn’t born as soon as the medical team had expected, corticosteroid therapy may be repeated. Corticosteroids can provide enormous long-term benefits when given to the baby in the womb, although there are also certain risks associated with this treatment. After delivery, medical staff should provide premature babies with surfactant. Surfactant is a lipoprotein that helps the lungs be more pliant and able to easily expand and retract. Mature lungs have millions of alveoli (airways). If a baby has insufficient surfactant, the lungs will be stiff and these alveoli can collapse, leading to breathing trouble (even if the baby is on a ventilator). Surfactant helps prevent the alveoli from collapsing at the end of exhalation and helps open collapsed airways. A baby with stiff lungs on a ventilator can become seriously injured. Babies with stiff lungs and respiratory distress are prone to lung infections and pneumonia. These conditions can cause the baby to be oxygen deprived, which in turn can cause hypoxic-ischemic encephalopathy (HIE), periventricular leukomalacia (PVL), and cerebral palsy. Thus, surfactant is very important for the baby. If the baby is born before 35 weeks – and especially if the baby is born before 30 weeks – it is highly likely that surfactant replacement therapy will be needed. The first dose of surfactant is typically given right after birth, or shortly after breathing problems are revealed. Three doses of surfactant are usually given within a 72 hour period. Magnesium sulfate can also be given to the mother to protect the unborn baby’s brain, and to decrease the chance that the baby will develop cerebral palsy. When a physician suspects that a mother is going to give birth to a premature baby within 24 hours, they should start to administer magnesium sulfate. The medication is typically administered when the baby is between 24 and 32 weeks of gestation. Magnesium sulfate should be administered to women with preterm premature rupture of membranes (PPROM), preterm labor with intact membranes, or indicated preterm delivery. Approximately 4% of all premature births are due to preterm premature rupture of the membranes (PPROM), which can be caused by infections such as chorioamnionitis. PPROM can also cause an infection in the baby; when the membranes rupture (when a mother’s ‘water breaks’), infection in the mother can travel to the baby. These infections can be life-threatening, and place the baby at risk for sepsis, septic shock, meningitis, and cerebral palsy. Infections in pregnant women must be promptly recognized and treated with antibiotics in order to prevent (a) infection from traveling to the baby and (b) premature birth. If PPROM occurs, medical staff must promptly provide antibiotics. The longer the time between the rupture of the membranes and delivery of the baby, the more likely infection is to occur. The risk significantly increases if labor does not occur within 12 hours of the membrane rupture. When PPROM occurs between 34 and 37 weeks, labor usually will be induced. Most experts feel that the risks associated with infection are greater than those associated with this degree of prematurity. If PPROM occurs before 34 weeks, the situation is more complex. If there are no signs of infection, the physician may try to delay labor with tocolytics (progesterone) until the baby’s lungs are more mature. Medical staff usually administer antibiotics and corticosteroids to aid in lung development. The physician may collect a sample of fluid for analysis to determine if the baby’s lungs are mature. If they are, labor will be induced. When PPROM occurs between 32 and 34 weeks, the standard recommendation is less clear. These cases require careful evaluation and frequent reevaluation. Corticosteroids generally are administered in such cases when there is documented fetal lung immaturity and no evidence of chorioamnionitis. When PPROM occurs before 32 weeks of pregnancy, it is best to delay delivery. Medical staff should provide a course of corticosteroids. The key to understanding PPROM is that a premature baby with an infection is much more worrisome than a premature baby without an infection. Ideally, the baby should be delivered the hour before the womb and baby get infected. This is difficult to predict, so close monitoring is critical, and signs of infection or changes in the baby’s tests (even subtle ones) should be relied on. Premature birth puts a baby at risk of having numerous birth injuries. Physicians must recognize risk factors for premature birth and follow standards of care to prevent the baby from being born preterm. If a preterm birth is likely to occur, the baby should be given corticosteroids, magnesium sulfate, and antibiotics, if indicated. After birth, surfactant may also be necessary to help with the baby’s lung development. Timing of the administration of these drugs is crucial, which is why the mother and baby must be very closely monitored. 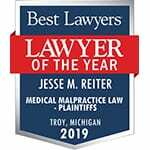 If your baby was born prematurely and has a condition such as hypoxic-ischemic encephalopathy (HIE), cerebral palsy, a seizure disorder, or periventricular leukomalacia (PVL), contact the award-winning birth injury attorneys at Reiter & Walsh ABC Law Centers. We have helped children throughout the country obtain compensation for lifelong treatment, therapy, and a secure future. Our firm has numerous multi-million dollar verdicts and settlements that attest to our success, and no fees are ever paid to our firm until we win your case.